We manufacture and provide a unique collection of shawls & scarves made with the blending of silk & wool. Its both a good scarf along with the price affordable to all. 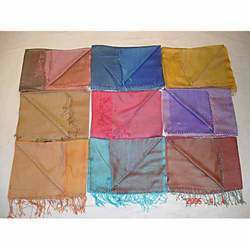 Our range of silk wool shawls includes silk wool reversible shawls. We are offering a unique collection of silk wool reversible shawls. These silk wool reversible shawls are softer in touch and are very light weight. These are offered in different color options to match the customers requirement. Looking for Silk Wool Scarves ?